A regular wargaming opponent and I decided to take the opportunity of a recent public holiday to deploy some figures and refight the Battle of Wavre. While I’ve not played Wavre for a number of years I felt comfortable that it would fit well into our limited gaming window of four hours. In preparation I spent some time revitalising some Wavre specific terrain and reviewing the orders of battle for both armies. 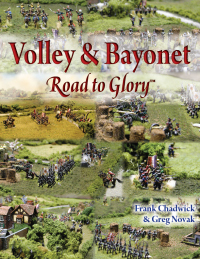 The scenario is outlined in the Volley & Bayonet scenario book “Napoleon Returns” along with the other battles of the Hundred Days Campaign. The scenario book utilises ratings and organisations for the first edition of the rules. Not surprisingly wanted to use the ratings that Frank introduced in the second edition of the rules, so some updates were required. In a future post I will aim to outline these changes, including some variations I have decided to include. For now I will focus on a few photos of our game. As a refresher the Wavre scenario, like the battle on the 18th of June, effectively starts at 3pm and runs until the end of the 9pm turn for a total of seven turns where each represents an hour. The scenario then allows a portion of the second day to be played. As can be expected the our refight of the battle opened with a substantial and concentrated attack starting around 3.30pm by a massive assault on the parts of Wavre located south of the Dyle River. As the Grouchy hoped the position was carried Prussians reeled back in disorder. Above, the general view with Wavre in the foreground being attacked by Lefol’s 8th Division and Berthezene’s 11th Division. While below another view highlighting the Prussian regulars. Behind them a Landwehr unit can be seen in northern Wavre. Below, Lagarde’s Brigade occupies the southern sectors of Wavre. The disorganised retreat caused considerable confusion to Prussians located on the north bank. With no substantial counterattack forthcoming Grouchy pressed forward. By a feat of arms he had by 4.30pm, and now supported by two batteries of 12pdrs, secured a portion of Wavre on the north bank. Below, Grouchy advances across the bridges into the areas of Wavre on the north bank. Yet his advance was short lived and 5pm Grouchy and Lagarde’s Brigade had been routed completely out of Wavre! Another attack was launched around 6.30pm but unable to regain the momentum the northern parts of Wavre were to remain in Prussian control. Some two miles south, at Limale, another attack was taking place. An initial bombardment had caused some casualties on the Prussians here. Teste, commanding the 21st Division now ordered an attack and the composite brigade surged forward to be meet by a hail of Prussian fire. Disordered by the confines of the narrow bridge French troops the attack suffered heavily and the brigade would play no further part in the action. Following this repulse Gérard, commanding IV Corps, issued more conservative orders to General Vichery who commanded the 13th Division who had now been tasked with securing this crossing. As a result Vichery ordered a long range bombardment of Limale and surrounds – which was unfortunately woefully ineffective. With the other attacks stalled Grouchy focused on the crossing near the Bierge Mill, slightly south of the village of Bierges. Initial attacks were supported by a bombardment but around 4.30pm Gengoult’s Brigade surged across the bridge. Above, 10th Division supported by other elements engages the Prussians at Bierge. Despite being repulsed after a bloody melee further brigades formed up and progressively attacked over the following hours. These attacks here were particularly confusing and difficult to summarise. Below, an attack around 6.30pm. Of note the Prussians are no longer defending the banks of the Dyle. However, by 7.30pm a foothold was gained by the French on the north bank. In part as the Prussians opposite were paying a bloody cost for their determination. This bridgehead was no sooner gained than it was lost, only to be secured around 8.30pm. Below, the situation around 9pm. Prussian counter-attacks were thrown back and by 9.30pm French artillery started to cross. Yet this foothold was fragile and by 10pm this tenacious bridgehead on the north bank of the Dyle was lost. As darkness fell so to did the French hope of securing victory. It had indeed been a bloody day at Wavre. Wavre was an excellent battle to refight, I had forgotten how enjoyable it is. An error I did make was how to represent Limale. Due to the area the village occupied I represented it as as a V&B town sector. Further research confirms the buildings within the village were dispersed. As a result it would have been more realistic to model it as a village. All miniatures are from my own collection and are all from the excellent 6mm Heroics & Ros miniatures. They are all based at half scale where 1″ represents 200 yards. Trees are from Irregular Miniatures, hills and roads are home made while the river is a Battlefront “Stream Section”. The table measures 1.2m in width and 0.9m in depth. Thanks for taking the time to comment Peter, and for your positive feedback.